Zhou Xun and Gao YuanYuan in "Beijing Bicycle"
Beijing Bicycle is a 2001 film by Wang Xiaoshuai that begins as a story of young love and becomes a harrowing, blood drenched look at class conflict and the its potentially murderous consequences in China's capital city. It begins with shots of men from the countryside being interviewed as bicycle messengers for a busy document delivery company. They are the almost perfectly unsophisticated, unable to estimate how much they were paid while in the country and willing to do just about any job available. One of them is Guei who becomes the top earner in the company, able to make enough in a month to buy the mountain bike and getting a much better payout from the company. Guei lives with Mantis an older friend/cousin who has a tiny store in an alley, where they are able to look upon Qin, a resident of a luxury building that overlooks their alley. Qin, played by Zhou Xun, is as much a part of the "real" Beijing as the building she lives in or the high fashion outfits she wears. Their only contact with her is when she stops into the store occasionally to buy soy sauce. The day that Guei finishes paying for his bike it is stolen and he is fired. Since the bike is the only way Guei can earn enough to stay in Beijing and also because he has a single-minded determination to find his it, he tracks it down. The bike is with Jian, a working class teenager who strives to be like the group of guys in his class at a private school and who are from wealthier families than he. The bike itself is an example of this--Jian doesn't have a bicycle when we first encounter him but is able to buy a used bike--Guei's bike. His friends all have new bikes given them by their parents, people who could live in the same type of apartment as Qin, the unobtainable beauty who entrances Guei. Jian now fits in with his buddies and has the self confidence to approach Xiao a beautiful classmate who, it turns out, has had her eye on him. She is played by Gao Yuanyuan. Neither of the young actresses in this film have much to do. Zhou Xun's character is superfluous to the plot and structure of the movie--her scenes could be cut and not missed. Qin's story could be told as a short film in itself. Gao Yuanyuan has more screen time than Zhou Xun and Xiao, unlike Qin, actually has a few lines to speak. This is not a review or summary of Beijing Bicycle but only serves to establish the characters played by Gao Yuanyuan and Zhou Zun. First Zhou Xun, dressed and made up in borrowed finery, comes with her bottle to filled with soy sauce. Guei and Mantis can are so finely attuned to her movements that they can hear the "tip-tap" of her high heels from around the corner. Having effortlessly cast her spell on the guys she leaves. It isn't until much later in the film that Guei literally runs into Qin as he turns into the alley without looking. Oops. Qin suffers from the malady that affects the characters played by beautiful young actresses: even after being run over and knocked unconscious her hair still falls perfectly around her face, her make-up remains unsmeared and the only apparent injury is a tread mark on her arm. She awakes from her collision induced slumber, looks around and tries to figure out what is going on. Qin returns the next day and desperately goes through everything in the tiny house/store, wordlessly trying to find something that she may have lost there and slumps in dejection when she is unsuccessful. Zhou Xun doesn't get to do much but looks ravishing during every second she is on screen not doing it. 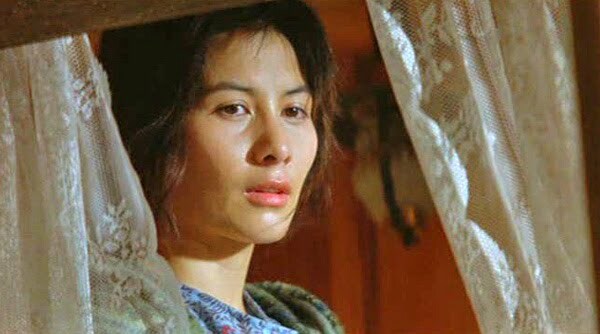 We first see Gao YuanYuan as Xiao when she encounters Jian in a well done "meet cute" scene that centers around a bicycle--hers in this case. She needs help with it but seems reticent to ask although she overcomes her shyness. They become something of a couple. On a ride into a park Xiao decides it is time for things to get a little more serious between them and effectively draws Jian toward her. This is a lovely sequence of attraction and response. It is interrupted when Jian sees Guei ridding away with Jian's bicycle with is also Guei's bike. The next day in school Jian is upset and refuses to be comforted although Xiao tries. Note Gao Yuanyuan's reflection on the far left side of the screen. Someone much more versed in the semiotics of representation and the deconstruction of narrative filmic text through signification should explain what the reflection means. As far as how it looks--it is striking. This is only a few small pieces of Beijing Bicycle which is uneven but brilliant in parts and which I may revisit more analytically (with fewer pictures of actresses) later on. Li Bingbing makes cover of "Trends Health"
Li BingBing was on the cover and in an editorial in the magazine Trends Health for "promoting public awareness of environmental protection" and because she is gorgeous. Zimbio brings us three pictures of Maggie Q doing her shopping on Sunday over the caption Maggie Q picks up some fresh produce at a Los Angeles farmer's market. Maggie is set to return to the small screen soon in The CW's "Nikita". She must have been a target of opportunity for the paparazzo/stalker/photographer since Zimbio sent it out under the odd heading: Oscar-winner Christoph Waltz spends Father's Day at a Los Angeles farmer's market with his five-year-old daughter. Even though each of then has certain shared characteristics--Josie Ho is the daughter and presumed heiress of a wealthy man; she is young, talented and attractive; and she has a career as a singer and actress that is based on her hard work and willingness to put in the requisite time and effort. Paris Hilton is the daughter and presumed heiress of a wealthy man. "I have so much energy… maybe that’s why I have so much anger. Now that I’m older, I get even angrier. I feel there are more forces obstructing me." The idea of Josie Ho having to deal with forces obstructing her, while real enough to her, is hard to fathom given her material/social/class advantages over 99.9% of the population of Hong Kong--and maybe the rest of the world. However she presents herself in an interview, she is still a terrifically talented and committed actress who is often riveting onscreen. A good example of this is Johnny To's crime drama Exiled in which she plays the perfect Triad wife trying to keep her husband alive during the last hours of Portuguese rule in Macau. This is not a review of Exiled--there are plenty of reviews--but a quick look at Josie Ho's role in it as the only person who is neither a killer nor someone who profits from killing. Her husband, played by Nick Cheung, is returning from overseas in an attempt to pack up his family and get them somewhere safe. Anthony Wong and Lam Suet are waiting to kill him while Francis Ng and Roy Cheung are there to thwart the killers. None of them is as committed as Josie Ho. A couple of quick shots from the Shanghai International Film Festival with more to come. The online Chinese entertainment press is flooded with coverage but if your Chinese is limited or you just don't want to wade through a number of sites Dennis Lee has done most of the work for you. Michelle Yeoh and her co-star in Reign of Assassins Jung Woo-Sung on the red carpet. Michelle Yeoh looks great while Jung Woo-Sung, a heartthrob in Korea where his buffed up image has moved a lot of merchandise for brands like Guess, seems quite young. In the bad news, maybe not so bad news department THR reports that The Weinstein Co. has acquired North American distribution rights to Reign of Assassins which means there might be a timely release of the R1 DVD but it may never show up on the big screen here. John Cusack and Gong Li are hyping "Shanghai" which is finally opening after many long delays. They were at a press conference and then the premier yesterday. Hilarity ensued. A few pictures from the premiere of the Mexican film "Biutiful" at Cannes showing the combination of fantasy, commerce and a bit of art all timed and planned to work with a very complex schedule. An wide angle view showing some of the beauty of the setting: palms trees so perfect that they might as well be props, brilliant sunlight highlighting the whiter than white Mediterranean buildings that serve as such a lovely backdrop, the photographers in place trying to get a great shot. To the left of the center of attraction, Fan Bing-bing, is a blond woman in a long blue dress. She may be one of the people that keep everything moving while also making sure that the lensmen have the time to get the pictures they need and the crowd watching feels they have seen a real movie star. A slightly closer in shot. The woman in blue is closer to the action, accompanied by an Asian woman, possibly a translator or aide for Fan Bing-bing. Probably a little later on--the couple outlined in green look to be the next subjects while the photographers seem have spent enough pixels on Fan Bing-bing are are waiting for them. Some of the intensity is apparent as we get down to the level where the work is being done. If the photographer outlined in the red box shouted that much every time a new celebrity appeared in front of him he must need a week to get his voice back. Some of the results of the planning, standing around and yelling: Swarovski sent her their "Film" handbag to carry (I have never figured out what, if anything, an actress puts in her little purse when it is not really a purse but a prop for an unofficial advertisement) while jeweler Piaget supplied a few million dollars worth of white gold and diamonds from their "Limelight" collection to adorn her wrist and ears. Both fashion accessory companies got what they were looking for.